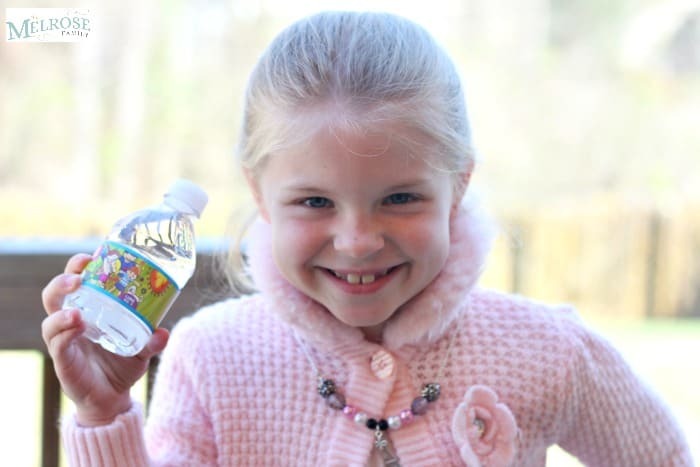 Thank you to NESTLÉ® PURE LIFE® 8oz “Share-a-Smile™” Kid Designed Edition for sponsoring this blog post. All opinions are my own. The warm weather is already teasing here in North Carolina so I already have the mindset of laid back Summer days, which will consist of a ton of swimming, boating and trips to the playground. In order to make that all happen, I need a summer lunch for my girls that I know I can throw together quickly and will keep well. The majority of last summer we were either traveling or out all day long. Whether we were at the pool, out on the lake boating and fishing or at the playground for a picnic lunch, I needed more easy lunch ideas so that the girls didn’t get bored with lunch. One thing that I always make sure to pack is plenty of water. NESTLÉ® PURE LIFE® 8oz “Share-a-Smile™” Kid Designed Edition 8oz water bottles are a convenient size for families on the go making it easy for kids to stay hydrated throughout the day, which is just what we need. Did you know that replacing a single 12-ounce, 140 calorie sugar sweetened beverage with water each day for a year can cut more than 65 cups of sugar from one’s diet? There are always times that I regret some of my parenting decisions, but the fact that my girls primarily only drink water because I never gave them anything else is definitely a parenting win for me. Especially since drinking water is one of the biggest “healthy habit” struggles moms have with their kids (38%), even more than struggles like “eat your fruit” (29%), “get enough exercise” (23%), “eat your breakfast” (19%), and “drink your milk” (18%). 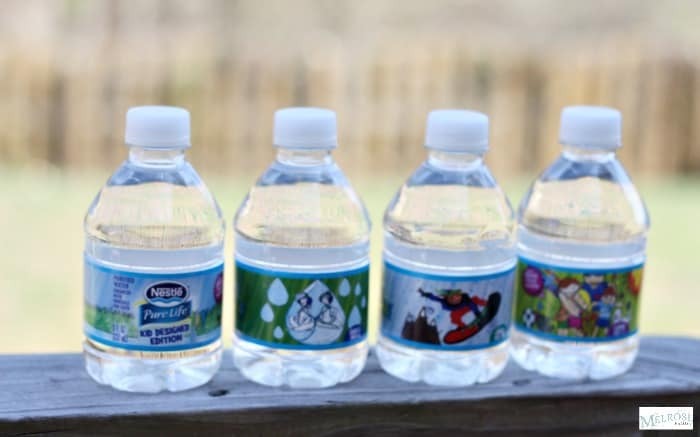 Plus, how easy is it to pack these Nestlé Pure Life Kid Designed Edition 8oz bottles. We usually throw in a dozen and they get us through the entire day. 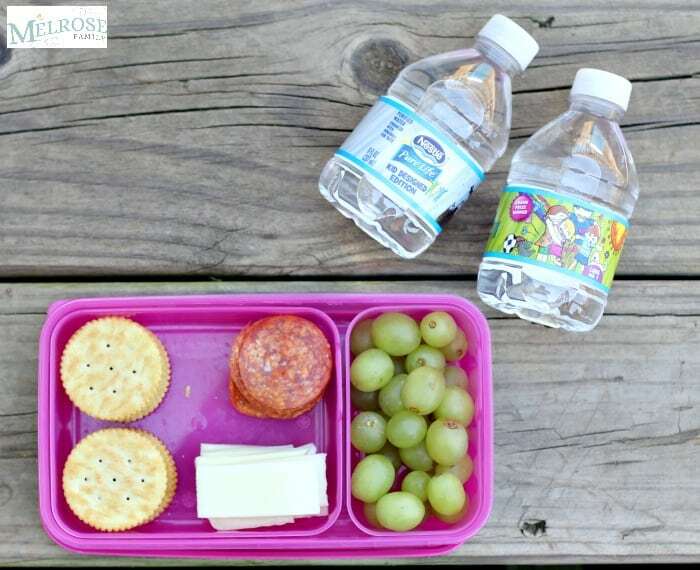 My girls love any lunch ideas where they can serve themselves so the Nestlé Pure Life Kid Designed Edition combined with these easy pizza crackers and grapes are the perfect idea. Even my youngest can help herself and they love the fact that they get to have pizza for lunch. All you need to make this easy summer lunch idea of pizza crackers are crackers, pepperoni and mozzarella cheese sliced into bite size thin, squares. My oldest likes to eat the pizza crackers with one slice of cheese and a pepperoni on top of one cracker, while my youngest likes to create a pizza crackers sandwich with two slices of cheese, one pepperoni and a cracker on either side. No matter how your children put them together, they’re sure to love to independence of “making” lunch themselves. I love this blog. Thanks for sharing. I love it. Thanks for sharing. I love this idea and I think my daughter will be happy to see them.